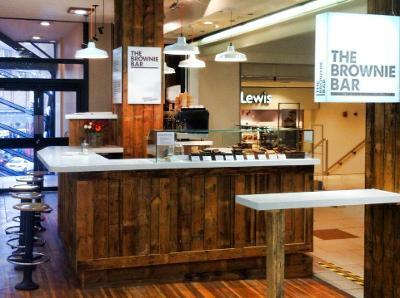 Our city centre location offers a wide range of brownies and blondies, and a selection of hot and cold drinks. Ice cream Milkshakes, coke floats, teas and coffees. We only have 5 stools at the bar so space is limited. If you're looking for a sit down treat head over to our Heaton store. Located in the Heaton neighbourhood, just outside of the city centre, we've expanded our menu offering, with a wider range of drinks, grilled cheese sandwiches and afternoon tea. There's also longer opening hours in the evening, and lots more seats to enjoy our treats. Of course we still have an extensive brownie menu on offer.